Will synthrapol remove color from fabric that has been photo-printed? Message: Will synthropal remove color from fabric that has been photo-printed? 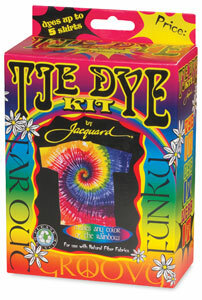 This activity set comes with sun paints, brushes, white cotton bandanas, and metal rings. 60 page instruction book. This book explains the chemistry and practice of five non-silver processes: cyanotype, vandyke, gum bichromate, kwik-print, and Inkodye. Which kind of photo printing are you talking about? Synthrapol will not remove any properly-fixed fabric photo print. Photographic images produced by cyanotype, also known as blueprinting, must not be washed with an ordinary phosphate-containing detergent, because the phosphate turns the blue to yellow. Synthrapol is ideal for washing blueprinted fabric, because it is free of phosphates and has a neutral pH. Any laundry detergent that is free of phosphates, soda ash, borax, or bleach is okay, though, if it is used gently and as infrequently as possible. Do not line-dry cyanotype-printed fabric outside, because sun exposure will eventually cause fading. If you are photoprinting with light-sensitive vat dyes, such as Jacquard’s SolarFast dyes or Lumi’s Inkodyes, then washing is an important step in developing the images. After exposing the dye-painted fabric to light, you must wash away the unfixed dye with soapy water, to make the photo image appear. Jacquard actually sells a product especially designed for this purpose, called Jacquard SolarFast Wash, while Lumi is now selling a product called Inkowash, but Dharma Trading Company’s instructions for washing out Inkodyes after the light-fixing step call for Synthrapol or their generic equivalent, and the extensive instructions for Inkodyes in Suda House’s book Artistic Photographic Processes call only for warm soapy water, rather than any special detergent. Fabric that has been sunprinted using a transparent fabric paint, rather than dye, should not be washed right away. The paint must be allowed to dry thoroughly before heat-setting, either using a hot iron or a commercial clothes dryer. (Home clothes dryers are usually not hot enough for ideal results.) After heat setting, wait at least 48 hours before washing the fabic. At that point, any laundry detergent you like will be equally appropriate. Heat-transferred photos on fabric, produced using a product such as Avery Iron-On T-shirt transfers, can be washed with any detergent without removing the image, but abrasion must be avoided. Prints made with either iron-on transfers or any sort of fabric paint should be turned inside-out before washing, and it’s a good idea to place each item in a large mesh laundry bag of the sort used for washing delicates. This helps to protect the image from wearing off. Fabric with heat transfers should be line-dried, rather than being dried with heat. For more information about different methods of photo-printing fabric, see my page, “How to Dye and Paint Fabric with Light“. This entry was posted in washing out after dyeing on July 28, 2014 by pburch.